Emilio Ambasz. Invenciones: arquitectura y diseño [exh. cat.]. Madrid: Museo Nacional Centro de Arte Reina Sofía, 2011, 245 pages. Translated by Marta Pino Moreno. ISBN: 978-84-8026-448-8. Spanish translation of essays by Barry Bergdoll, Kenneth Frampton, Peter Buchanan, Lauren Sedofsky, Dean MacCannell, Peter Hall, Fulvio Irace, Emilio Ambasz, Michael Sorkin, James Wines and Hans Ulrich Obrist, for an exhibition catalogue published by the Spanish museum of modern art Museo Nacional Centro de Arte Reina Sofía (MNCARS) on the work of the Argentinian-born architect Emilio Ambasz. 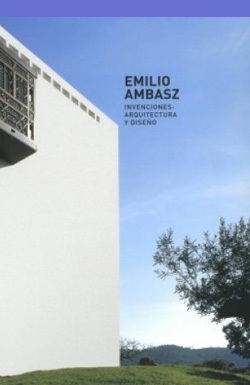 Exhibition title: Emilio Ambasz. Inventions: Architecture and Design. MNCARS, 2 December 2011  16 January 2012.